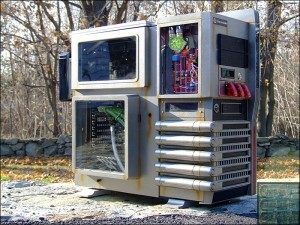 Our friend Will Lyon from over at thebestcasescenario.com is a master Computer Mod Designer. If you don’t believe me you can check out his latest project called Maximum Security. This badboy looks like he was yanked off the Nebuchadnezzar from the Matrix. The project sports a liquid cooling system, LCD readout, RedBee RFID reader and self opening door powered by a Firgelli Linear Actuator. Checkout the project thread here and the video below. Nice job Will!